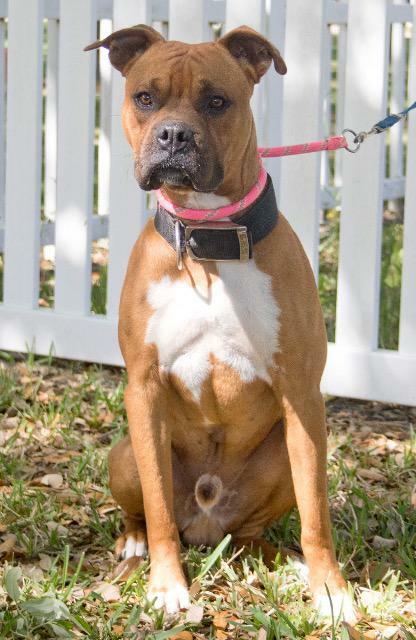 Meet Baxter, The Boxer, a full on nonsensical clown looking for a home that will appreciate his non-stop sense of humor. A family that can keep up with his practical joking and nonsensical attitude. He’s about a year old, has the attention span and energy of a 2 year old child and the heart of Andre The Giant (all except for cats that is!). Baxter is a pretty typical Boxer, with a velvety soft coat, snow white bib and boots and the most squishable face that a pup could ever thrust into yours. The Boxer was bred from the Old English Bulldog and the now extinct Bullenbeisser (German Bulldog) in an attempt to eliminate the excessive white coloring of the breed, but still about 25% of Boxers born that are white. Besides having the physical characteristics of his breed, Baxter also has the temperament. He’s bright, energetic and playful, as well as strong and easily bored. His family will need to have respect for his high intelligence and provide the mental & physical stimulation needed to keep this guy from going all “Macho Man” on them. Yes, this young fella can be a handful, a tad head strong and has a tendency to be a bit stubborn, but his exuberance for all things in life from treats and toys to human laps and cuddles, make him worthy of the extra effort he’ll need to become a fabulous, loyal and loving family companion.